Crosses don't have to be large in stature to have a big impact. The significance of these symbols is recognized across generations and cultures, enabling them to send a message about what you believe in a millisecond. These cleanly-cut cross studs make a statement of faith that's evident despite their petite size. Although they're small in size, these earrings stand strong, serving as no-nonsense pictures of your gratitude for what Jesus did for you on the cross. This knife-edge, beveled pair has a unique three-dimensional design that makes it clear that these earrings are top-notch pieces of fine jewelry. Earrings measure 9mm x 7mm and have standard push back posts. 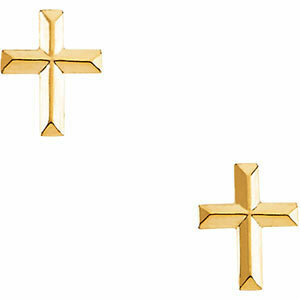 We guarantee our Beveled Cross Stud Earrings, 14K Yellow Gold to be high quality, authentic jewelry, as described above.